100% Real Remy Human Hair. Made from the highest grade hair for professional standard product. Soft, Natural Looking Hair. Hand-made to perfect. 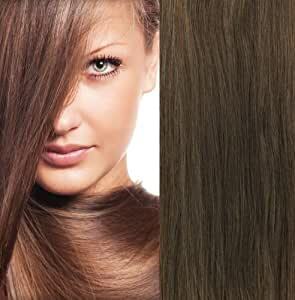 Tangle-free hair that can be curled, straightened, coloured, cut and treated as normal hair. 18 Clips, 8 Wefts. Total Width: 35" (89cm). 18 Clips, 8 Wefts. Extensions look real and natural once clipped in place. Each set has been cambered to fit the head in the most natural way. Total Width: 35" (89cm). The second image is for illustration only, please refer to the main image for colour accuracy of the hair. 100% Real Remy Human Hair. Made from the highest grade hair for professional standard product. Soft, Natural Looking Hair. ;Hand-made to perfect. Tangle-free hair that can be curled, straightened, coloured, cut and treated as normal hair. 18 Clips, 8 Wefts. Total Width: 35 (89cm). 18 Clips, 8 Wefts. ;Extensions look real and natural once clipped in place. Each set has been cambered to fit the head in the most natural way. Total Width: 35 (89cm). ;Set Contains: 1 x 8 wide weft (4 clips per weft); 2 x 6 wide weft (3 clips per weft); 2 x 4 wide weft (2 clips per weft); 1 x 3 wide weft (2 clips per weft); 2 x 2 wide weft (1 clip per weft);The second image is for illustration only, please refer to the main image for colour accuracy of the hair. 3.0 out of 5 starsOk. These are good quality for the price, but the clamps are too big and don't hold tight to my fine hair. This hair is gorgeous.color was true to the second picture of the actual wefts. Don't go by the original photo of the hair up close. Full and silky. Very pleased! Will be ordering from gogodiva again!